The HI-SEAS dome on the slopes of Mauna Loa volcano. (Image: HI-SEAS). 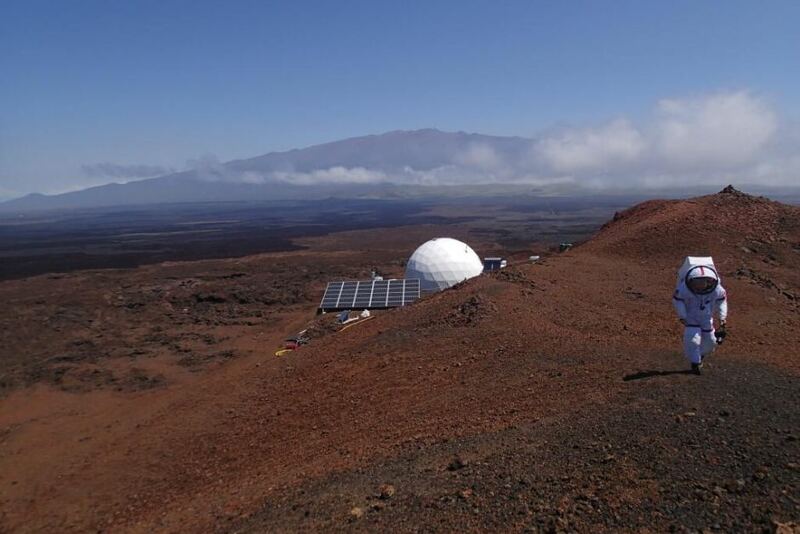 SIX HOPEFUL ASTRONAUTS have spent the last seven months inside a geodesic dome on the red slopes of Mauna Loa volcano in Hawaii to simulate what it would be like to live on Mars. It’s some way off from the real thing (~225 million kilometres on a good day), but researchers of NASA chose the red-fevered badlands of Mauna Loa especially for its resemblance to Martian territory. Reared amidst dust and rock, the white two-storey dome measures just 11 m across and has just one small porthole window. Six scientists have been living and working in this dome as part of a lengthy psychology experiment. It’s being referred to as the HI-SEAS project — Hawaii Space Exploration Analog and Simulation, an experiment looking into extended periods of isolation and confinement, run by the University of Hawaii and funded by NASA. It’s all part of NASA’s plan to send humans to Mars. This is the third of the HI-SEAS Mars simulations. The current crew have been in there since October last year. Mission commander, Dr Martha Lenio, a graduate of Australia’s University of New South Wales, lives inside the dome with her crew mates. “You look out the window and there’s no green stuff, there’s no trees, there’s no habitation really that you can see. There’s just rocks. Lava rocks everywhere. So it does look like mars when you look out the window,” said Dr Lenio (ABC). NASA hopes to be sending humans to Mars by the 2030s. For now, research is looking into the physiological, social and psychological aspects of what such a feat might entail. The trip to Mars alone could take as long as three years. And once they land the astronauts may be taking up long-haul residence. “The main point of the HI-SEAS study is to figure out how to pick a crew that works well together, that’s able to stay positive, happy, productive, and cohesive through a long duration isolated mission,” said Dr Lenio. Research is focusing on food, crew dynamics, individual behaviour, group roles and performance, as well as other aspects of space flight and the tasks that would be involved in the actual mission to Mars. The HI-SEAS crew on Mauna Loa are cut off from the outside world. They are confined to their small white “dome-sweet-dome” and look out through the one small window—just one, because on Mars humans would need constant protection from solar radiation. During their stay in the dome the crew have endured malfunctioning power systems and simulated radiation storms. To these, their performance and psychological response is recorded. If they fancy it, crewmembers are allowed to venture outside the dome, but only through simulating a full Marswalk: gearing up with a space suit and entering a pressurisation chamber. “We want it to be as Mars-like as possible,” Dr Lenio said. 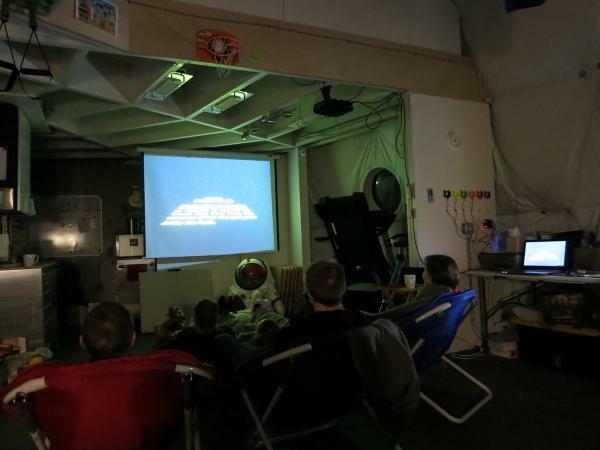 HI-SEAS crew watching Return of the Jedi on 4th May. (Image: HI-SEAS Twitter). The dome has a laboratory, a bathroom, an exercise area, and a tiny spread of bedrooms on the second floor. Inside the dome, the six faux Martians have limited communication with the outside world. Emails and internet use are artificially delayed by twenty minutes, simulating the time it would take a radio signal to travel from Earth to Mars travelling at the speed of light. Electricity is also restricted, as the crew mostly rely on harvested solar energy. During stretches of cloudy weather they tend to ration the power away from internet use, conserving electricity for running the dome and for the work they’re conducting for NASA. “We have a lab freezer, a deep freeze with human saliva, urine, and hair for the NASA studies,” said Dr Lenio. “We have composting toilets with fans and heaters on them and that is our major baseload, really, and if those go down the whole place will stink up,” she said. Seems reason enough to use power sparingly. Food in the dome is also an issue for the HI-SEAS crew, but not in the sense of paucity. The real problem has to do with something called ‘menu fatigue’. Eating the same freeze-dried, pre-packaged slabs of colour over and over again gets boring. It can lead to a loss of appetite, weight loss, even depression. These days we have humans living on the International Space Station for as long as six months, and the menu has been identified as absolutely essential to crew morale and psychological wellbeing (TED.com). The crew of HI-SEAS do get through the freeze-dried stuff, but every other night they engage in a bit of dome-home-cooking. “We’ve had really great falafel night. We had really great sushi. Pizza night is always a success, that’s one of our dovers. Burger night. BBQ night,” said Dr Lenio. Some of their food the crew has been able to grow inside the dome, under artificial light. Dr Lenio has been working on growing plants that include basil, coriander and lettuce. For the most part, the HI-SEAS team is calling the mission a huge success. However, approaching the final few weeks of dome life, some of the researchers have faced problems. “We’ve had a few rather difficult bouts of depression from a couple of crew members,” Dr Lenio said. The HI-SEAS crew, just prior to entering the dome. (Image: HI-SEAS Facebook). Worlds away, a crew living on the real Mars would have to function quite autonomously. Communication, direction, and assistance from Earth would be limited. The crew would need to be able to deal with problems themselves, including medical and psychiatric emergencies, such as trauma due to accidents as well as suicidal or psychotic thinking. Sending people up into space, let alone to Mars, is an enormous thing to do. And astronauts, just flecks of life in the immense and infinite blackness of space, are placed right in the crease-line of this almost mythic task. There has been a lot of work put into investigating the psychology of space-travel, as well as faraway confinement and isolation. Between 2007 and 2011, European and Chinese researchers conducted a series of psychosocial isolation experiments as part of their ‘Mars 500’ mission. The last of these experiments saw six men confined to a grounded spaceship for 520 days, simulating what it might be like to make the trip to Mars. There was some indication that the crew had adapted mentally to their difficult situation: heightened autonomy and decreases in crew member needs and requests made to mission control. Over time, the crew also appeared to display an increase in the homogeneity of their values; they also appeared to become more reluctant to express negative interpersonal feelings. Both these changes are suggestive of a tendency towards ‘groupthink’—a psychological phenomenon in which a group’s desire to maintain harmony or conformity within the group results in irrational or dysfunctional decision-making. Basically, no one wants to be the one to say that something is a terrible idea. On top of this, the Mars 500 crew experienced increased feelings of loneliness and perceived lower support from colleagues over time. (See: Kanas, N. et al. 2010; Kanas, N. et al. 2011; Roma, P.C. et al. 2012). 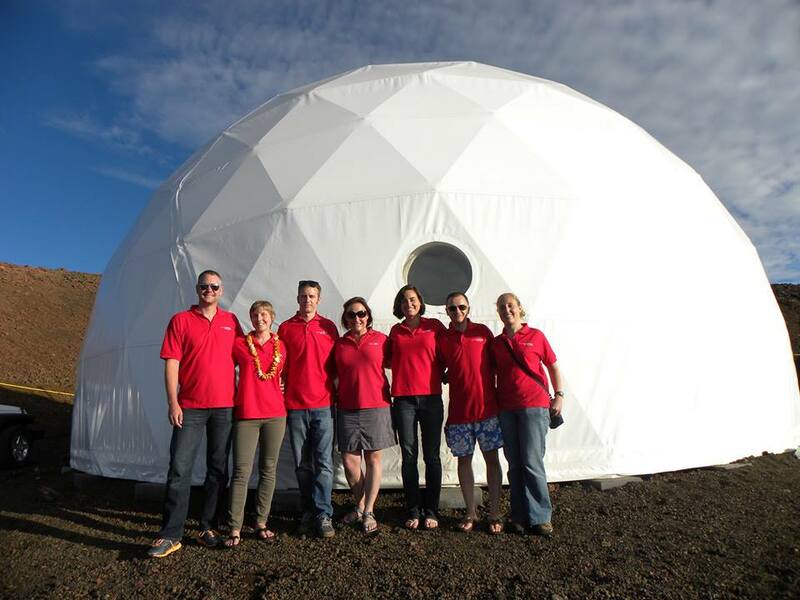 The psychological progress of the HI-SEAS crew in the Mauna Loa dome is yet to be fully mulled over. Generally, before an astronaut leaves Earth for the real thing, they are psychiatrically screened for any predisposition towards mental illness and psychotic episodes. While there are damper patches in the psychology of space-travel, it isn’t all bad news for astronauts. In between karaoke, pizza night and other Martian gaiety, the crew also take care of a pet fish named Blastoff McRocketboots. In two weeks’ time the researchers will emerge from the dome, simulating re-enrty into the Earth’s atmosphere with a skydive. Previous post ← Invisible, man.